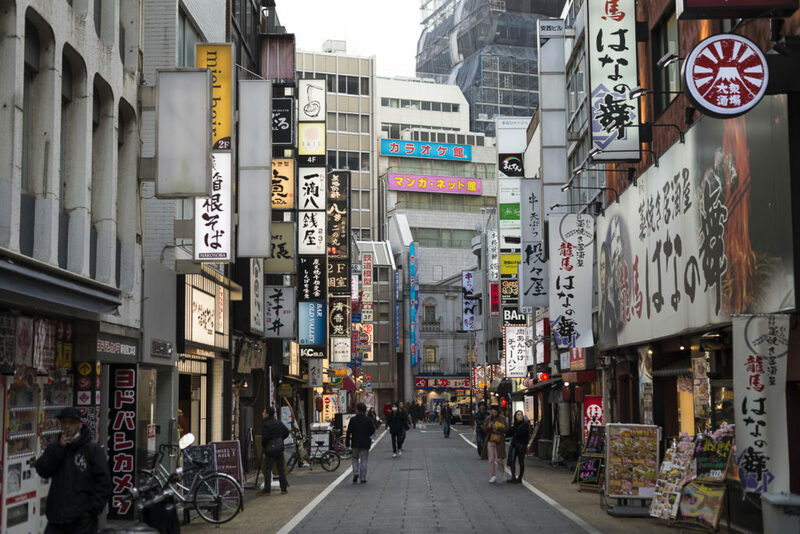 There are a few things you usually learn about Japan before you go there. There are the common things, naturally: Be polite. Respect the traditions. Especially respect people older than you. Say “thanks” on a regular basis (almost more often than when talking to British people). But there are also the more specific ones: Leave your shoes on the doorstep when entering a home and some public places. Don’t blow your nose in public. And, of course, take joy in all the amazing food! 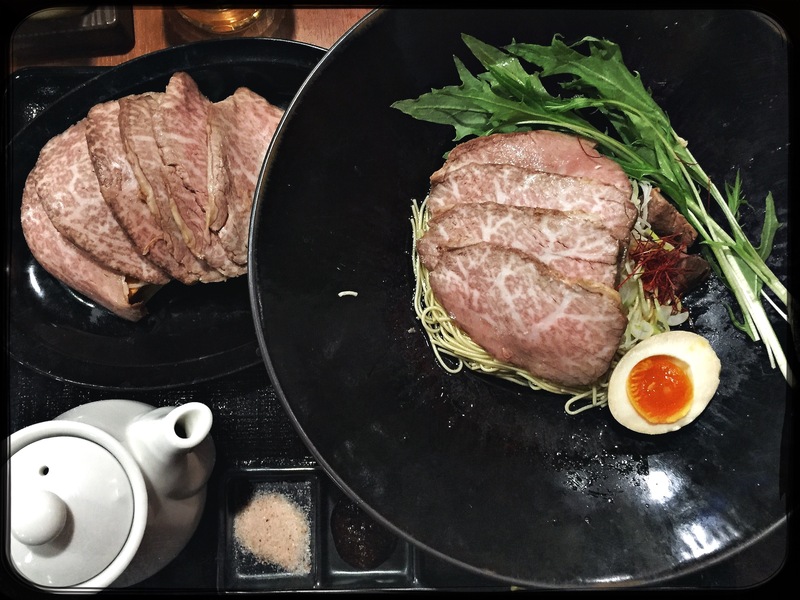 A general rule to eating in Japan is: Try everything. 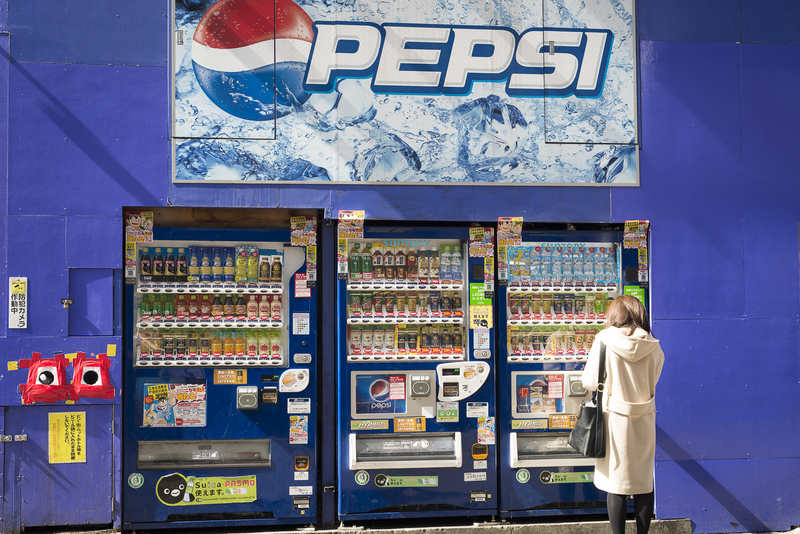 Make use of the vending machines that sell beverages all over the country. Make use of the konbinis and supermarkets with their astonishing offer of takeaway food like onigiri and sushi to go. And if you go out for a meal don’t look for the loudest advertisement. They try to lure tourists. Look for the quiet places, instead, the places that are crowded with locals. Try the little places, the ones that seem to have no space left whatsoever. And don’t hesitate to stand in line for a perfect bowl of ramen. It is Japan—it will be worth it! Ramen actually were our first meal in Tokyo and it should not only become a regular thing during this vacation but also one of these many “simple yet so wholesome” meals that we’ve both been missing ever since we came back home. There’s just a wonderful feeling a comforting noodle dish brings that can’t be put into words. Heavenly, maybe. Soul-lifting. And when you find your favourite bar you simply can’t help but come back. And back. And back. And back. Like Sharin, for example, which is one of those ramen places at which you order your food by using a vending machine. They mostly stand either directly in front of the entrance outside or close to the door when you enter. You choose your meal on the touch screen or buttons, choose an extra topping or additional drink if you like (depending on the place water or tea is always included in a meal), pay and hand over the ticket(s). 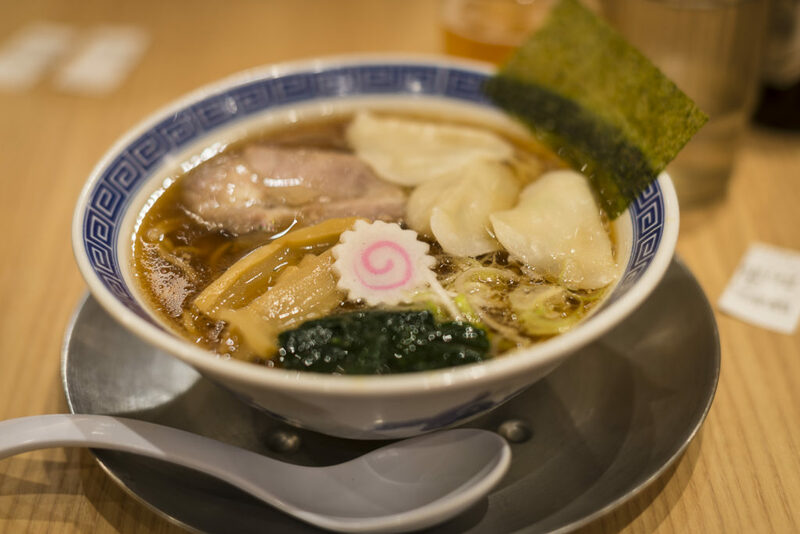 You can find it near Shinjuku Train Station and it lured us in on our first evening on our search for food with the promise of heartwarming, honest broth. We tried their traditional ramen. We tried the spicy ramen. 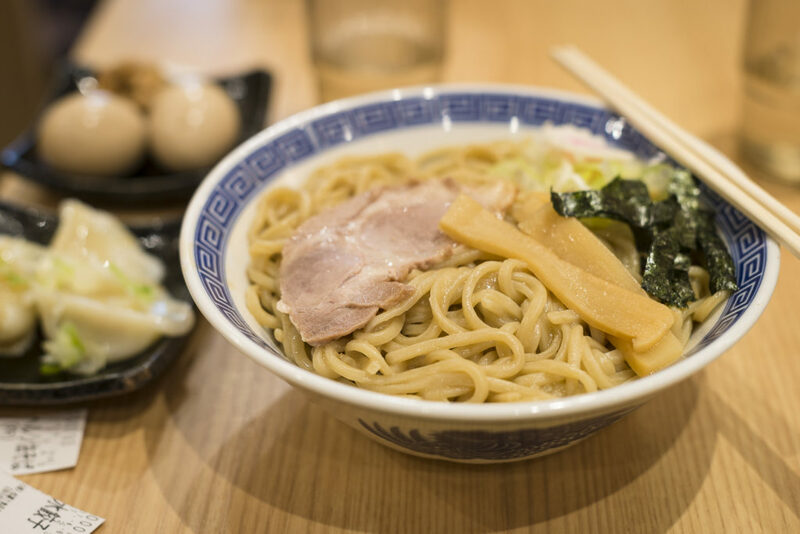 We tried the dip noodles (tsukemen). We tried their oiled noodles. We tried their gyouza. And every single time we went home with wide beams and happily stuffed bellies. 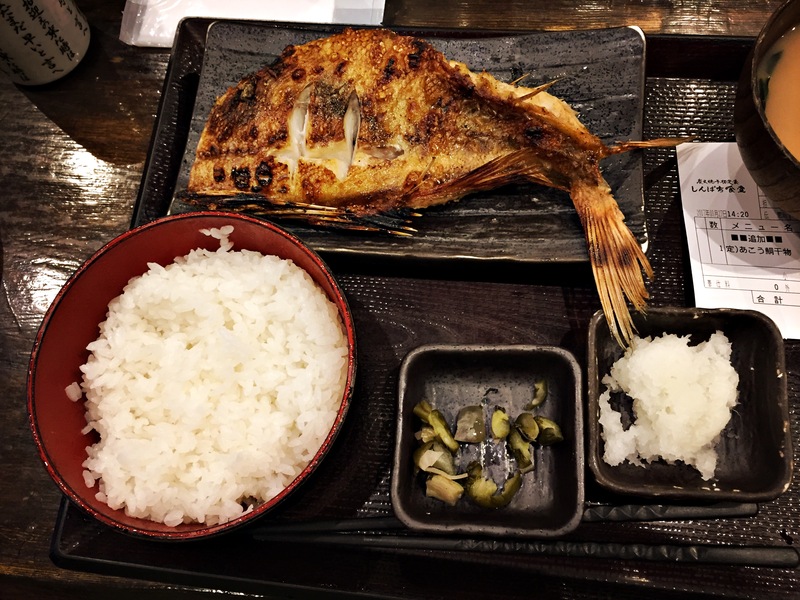 Another restaurant we fell in love with before we even set a foot in is Shinpachi Shokudô, this fish place just around the corner. 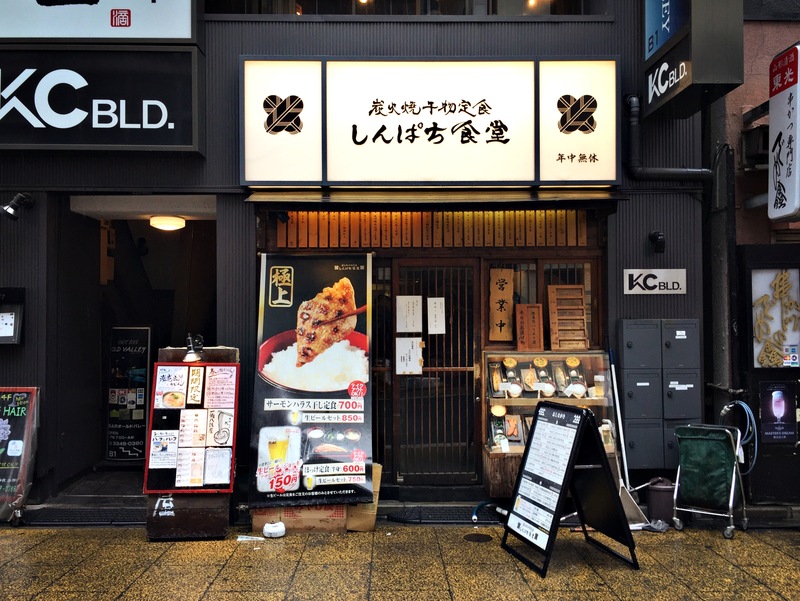 The restaurant is wonderfully traditional and well known amongst the locals, entices with a wooden front and the typically Japanese way of displaying food in a small window with plastic replicas. They looked amazing and the place was packed with customers every day at every time. A good sign and yet it took us a few days to finally give it a try and look if they’d have room for us. The place is so tiny that you have to squash your way in while you already grin at the delicious scents of grilled fish. The bar at which you get seated forms a U and the solemn silence in this stuffed place tells enough about the quality of the food. The customers seem to come here regularly, most of them order with entering and not having to look at the menu. A good sign. As is the efficiency of the cooks. The place specialises on fish. You choose your “main course” and it always comes with a tea, a portion of miso soup, shredded daikon (radish), pickles of the day, and rice. Try their sake marinated mackerel and their rockfish. Try the miso salmon and float up into fish heaven. Never ever did we have such delicious fish. And it even comes for a low price. The Kobe restaurant a parallel street further is worth a recommendation as well. 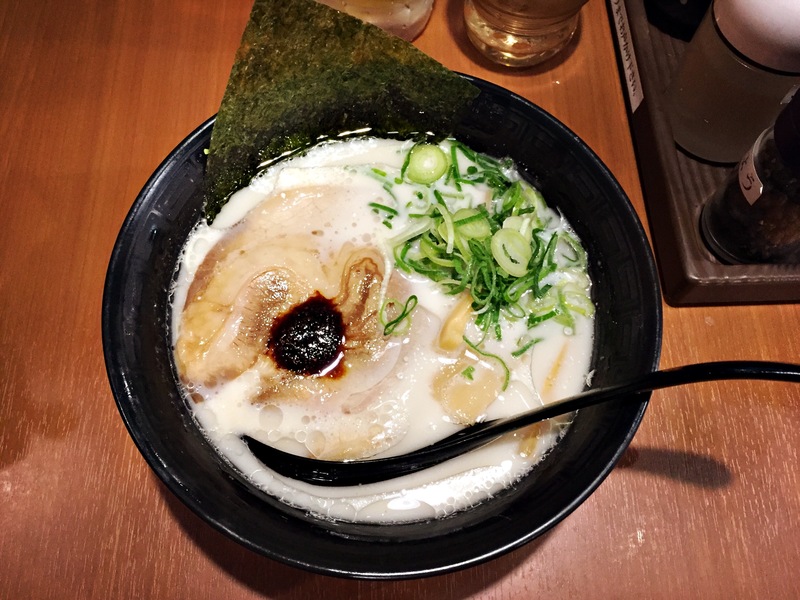 Their Kobe beef ramen is an absolute delight, as is their tonkotsu ramen… and their katsudon is a pure joy as well. If you care for something sweet instead Marion Crêpes is worth a visit. 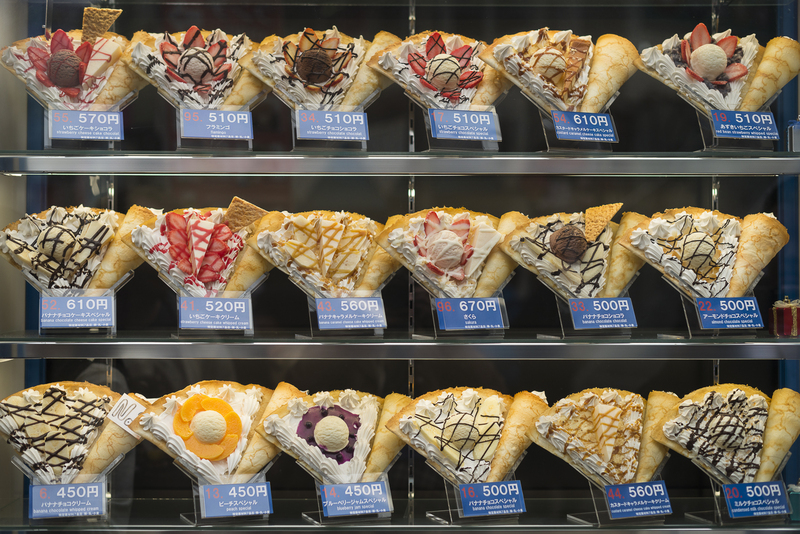 It sells crêpes in the Japanese way: rolled and stuffed with fruit and other delicious things. 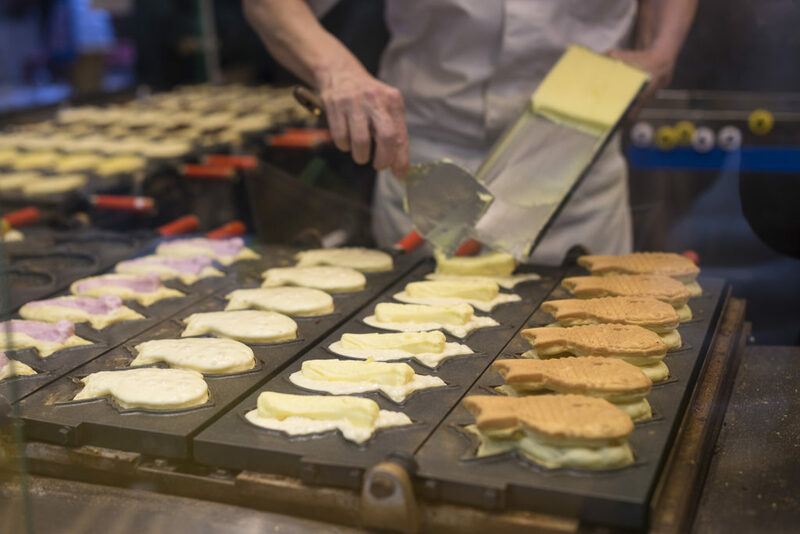 Take the Yamanote Line, cross the road in front of Harajuku station and dive into Takeshita street with its colourful life and youth culture until you come across the lines in front of the crêpe trucks to your left. Waiting is more than worth it and also gives you a bit more time to decide between the range of variety of the crêpes. 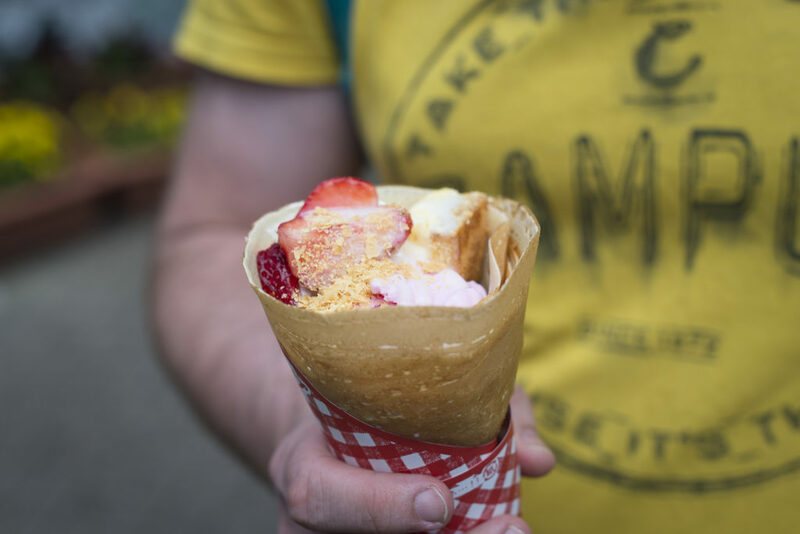 Our favourites so far: The strawberry, cream, and cheesecake crêpe and the sakura crêpe which is similar, but additionally has a ball of cherry ice cream on top of everything else that makes you want to cry with happiness. If that isn’t enough ice cream for you step back into the metro and drive all the way to Ueno station. Take the exit to the south and watch out for Baskin Robbins, an ice-cream seller in the basement of the adjacent mall. 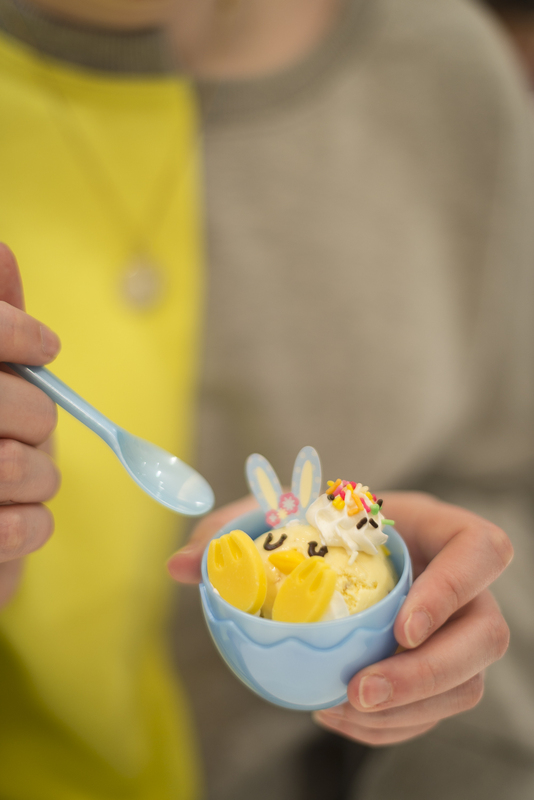 Admittedly, it might not be the most delicious ice cream ever you will get here, but it certainly will be one of the cutest. Choose between a range of adorable baby animals, pick your flavour and feel almost too besotted to actually eat it. For even more cute food go to Ikebukuro and head for Sunshine City. Directly in front of Tokyu Hands there’s a small stand by Swallowtail (a butler café) that sells cute little cakes, puddings and more. 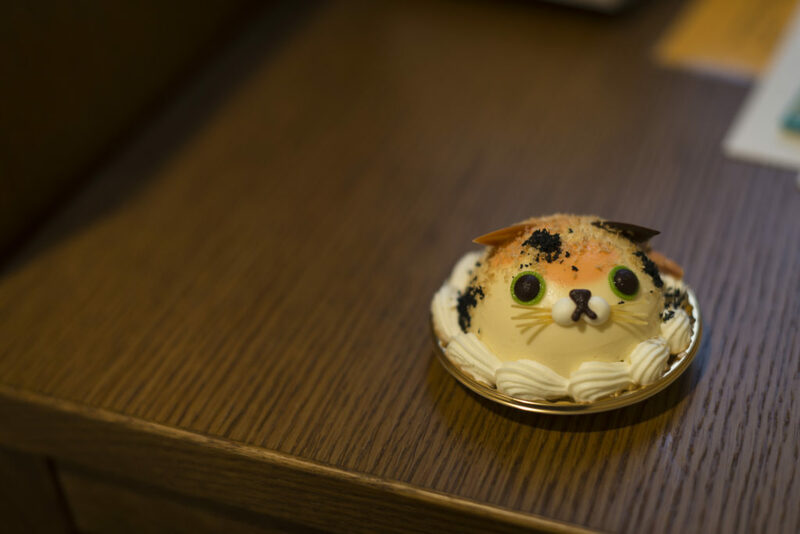 We admit we devoured this little cat’s eyes first, so they wouldn’t judge us. And the dessert itself (coconut pudding on top of a sponge dough) was super delicious! 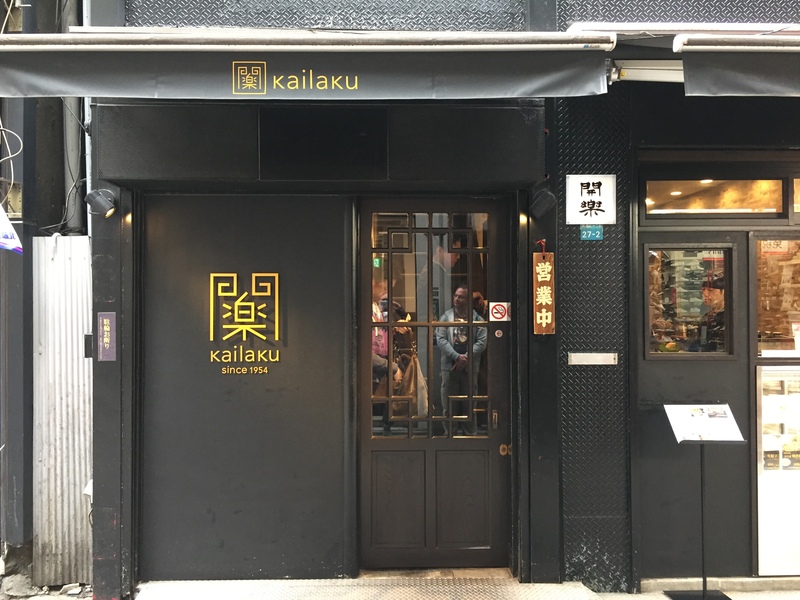 If you care for more heartily dishes afterwards head back in the direction of Ikebukuro station and make halt in front of Kailaku. They sell gyouza here and the nice thing is you can either order them to eat there, buy some to fry them at home or even have them fried as a takeaway meal. We did latter and feasted on them back in the hotel. And when the bellies are still hungry: Tokyo is beautiful in the evening too, with all its lights and city life, and all its street food. 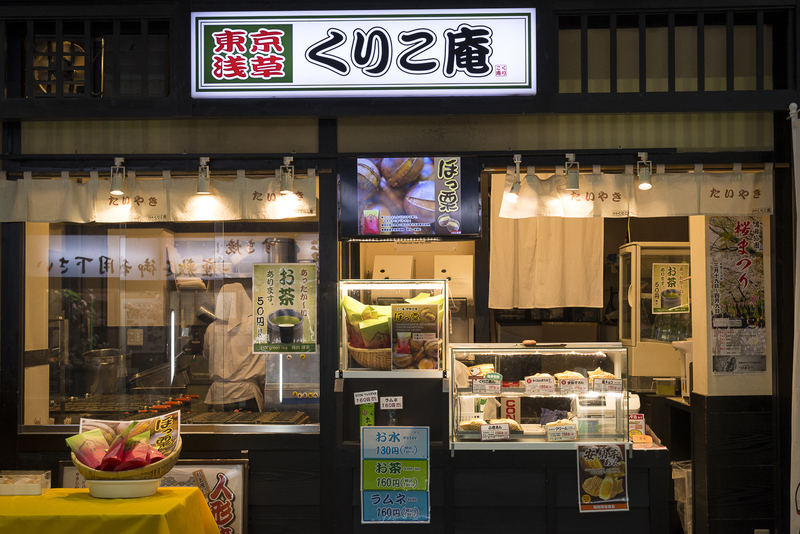 On our last two nights we strolled through Asakusa and found Yokohama Kurikoan, this wonderful Taiyaki place. 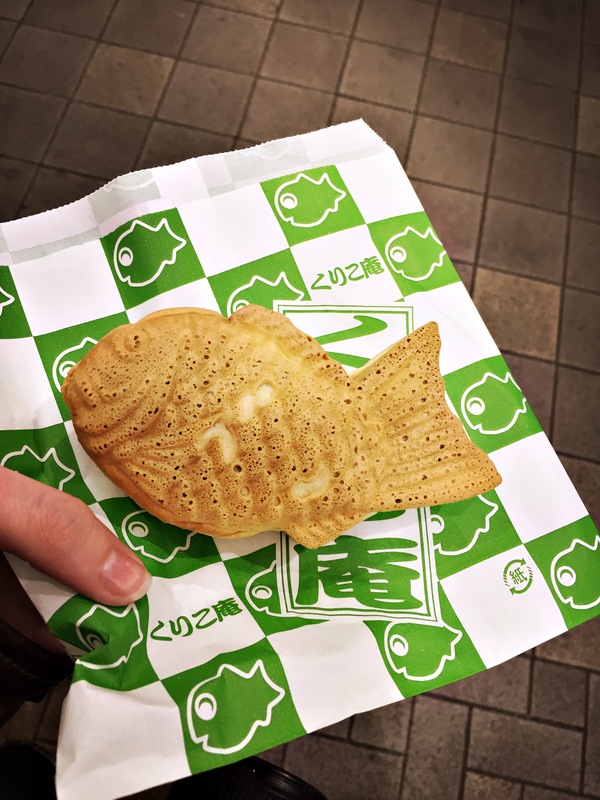 Taiyaki are fish shaped pancake sandwiches with mostly a sweet filling. 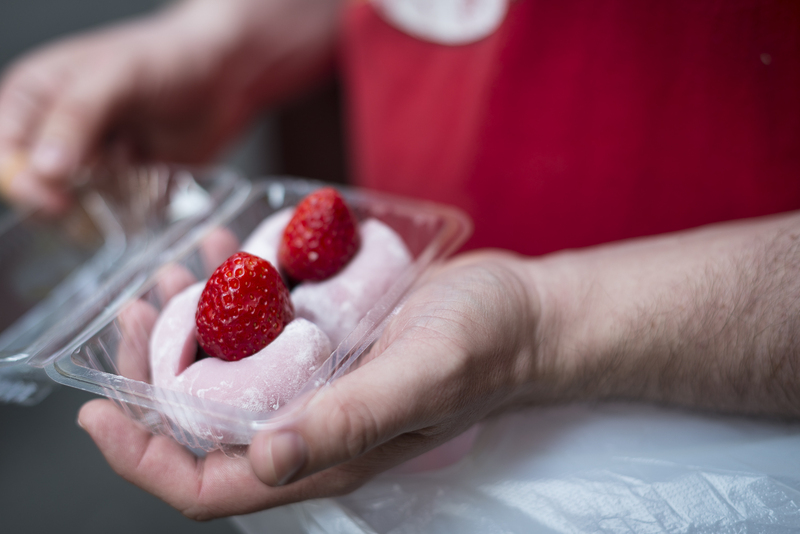 Try their recommended filling with anko (sugared red bean paste) and chestnuts and take delight in it’s perfectly balanced sweetness. 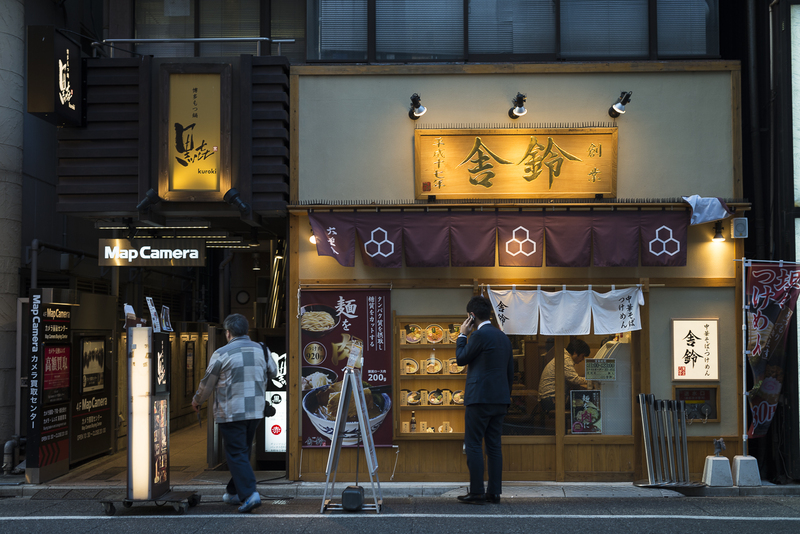 If you crave for something more liquid instead head a little bit further down the streets and order a cup of “Oshiruko to go” at Asakusa Coffee Akanesaryo to be rewarded with a hot anko soup with little rice balls to warm your soul. What a perfect way to end a wonderful day in Tokyo!